All about the new Monitor Audio Silver series range at Totally Wired. Can a single loudspeaker range appeal to almost everyone? Hitting that magical combination of competitive price, sparkling performance, and great looks is a real challenge - which is exactly what Monitor Audio are aiming for with their new Silver series loudspeaker range. This is a range that has been literally 40 years in the making. Designed in Britain, the Monitor Audio range has consistently grown and improved over this time, moving from being a handmade niche product to one of the heavy hitters in the audio world. At Totally Wired we've gradually been won over as each iteration builds upon the previous and reaches a point where we have to admit that Monitor Audio have outpaced almost all of the other designers we have dealt with over the years, both from New Zealand and around the world. If it weren't for the Italian inspiration of Sonus faber, we'd be able to run quite happily with Monitor Audio as our only speaker brand given the sheer breadth of their catalogue, with ranges to cater for every lifestyle and expectation of performance. The new Silver Series is a formidable range in its own right and covers as much ground as many other designer's complete offerings. From the entry level compact model Silver One at NZ$1300, you have a choice of 8 models and 4 finishes, covering both stereo and home cinema. You may already know about Monitor Audio and you'll be familiar with the previous Silver RX range as well as the new Gold series and penultimate Platinum models. The new Silver Series is to some extent derived from these but is also and expression of the very latest research and development. 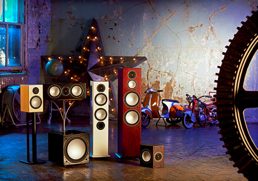 If you are after a seriously capable hifi speaker for your stereo system, there is no better place to start than this. The Silver One is the direct analogue of the award winning RX1 and itself the latest in a very long line of classic compact ported two way designs that have come out of the UK. The constant reinvention and refinement of the proven concept, not to mention intense competition drives the Silver One to be a remarkable speaker. The term 'entry level' isn't how we'd describe the Silver Ones - they are a lot better than that would imply and have greatly widened the gap between Monitor Audio's highly regarded Bronze series BX2 and this level. You can use the Ones on shelves, but a good pair of speakers stands (from around $300) will make a big improvement to their performance, allowing you to get positioning just right. The bass performance is well balanced and actually better than some highly regarded larger models. Given their reasonable cost, it is likely you'll consider the Silver Ones with a broad range of amplifiers. One thing they will do is make entry level electronic sound far better than you would expect. Conversely, the gain made by going up a little to theNuPrime IDA8 is even more obvious than it was with the predecessor model RX1. There is no downside. If the Silver One is an improvement over the RX1, the new Silver Six is a whole new world compared with the superficially similar RX6 - the start of the floor standing models, the new Six is transformed being much more open, dynamic and involving. The RX6 might have been Monitor Audio's most popular single speaker model and a hard act to improve upon but it's immediately apparent that 4 years is a long time in Monitor Audio's world and a large percentage of the goodness that makes the Gold range has found its way into this new model. The Six is a supremely competent all rounder and you'd be hard pressed to find another floor standing speaker that does so many things so well yet remains happily affordable. While sound quality is the key to the Sixes appeal, it has to be said they are a fine looking speaker - actually a little more compact than the RX6 with an improved finish and plinth. The wood work on all the new Monitor Audio models is exceptional in both quality and consistency, quickly approaching the ultimate standards set by Sonus faber. Given the improved performance of the Six you might question the need to go further. The sound of the Six with something like the NuForce DDA100 will better anything we could have done for the sharp end of $5000 even a couple of years ago. So the next model up really has to do a lot more - the Eight is a more significant redesign moving from a hybrid two way design (with 3 drivers) to a full 3 way with a separate midrange driver and enclosure and twin bass driver array - not to mention upgraded crossover and taller cabinet - all of which combine to bring this model alarmingly close to the Gold series GX200 in terms of its performance. Every aspect of the sound is better again than the Six, yet it's all contained in the same footprint and still slides in just under NZ$3000 the pair. It's at this point the older RX series ran out of options but Monitor Audio have again taken things further this time - the Ten is a seriously substantial speaker system. By considerably increasing the bass driver size and by necessity the cabinet volume, the Ten digs much deeper, is more efficient and handles more power - all of which make it suitable for the largest rooms and most demanding systems. If you want impact and scale from your speakers, then the new Monitor Ten is the one to go for. In years past we would have looked to NZ designers for a speaker with these proportions and driver configuration - but the reality of modern day manufacturing and economics is simply that the new Monitor Audio is not only directly comparable or better in performance, it's better built and finished, and substantially less in cost. You can do a lot with a $2000 saving! You'll be pleased to learn that Monitor Audio are just as aware of the needs of cinema enthusiasts as they are of music lovers. All of the options we've outlined above make superb options as front speakers in a surround system. And just as much thought and work has gone into the cinema options. The Silver centre accurately matches the tonal characteristics of all front models giving you crystal clear vocals and accurate placement of all centre channel information. The FX model is a specifically designed surround model which can switch between dipole or bi-pole operation, flush mounted on side or rear walls. And the new silver W-12 subwoofer simply rocks in no uncertain terms - the 12 inch bass driver and 500W amplifier combined in a substantial sealed cabinet delivers thunderous bass straight down to 22Hz. But it's also fast and agile with real control for music - you can easily fine tune the performance for any room and system with MA's Automatic Position correction system which automatically sets up the sub using a microphone and test tones. Just a couple of minutes to do and you'll always be assured of the best possible performance. Having got this far, you will no doubt either want to know more, or hear the Monitor Audios for yourself. That's where we come into the equation. Monitor Audio are a large company by HiFi standards but they are still run by enthusiasts rather than some faceless corporate. So you won't find Monitor Audio in chain stores. And while it may seem contradictory, you'll actually find that Monitor Audio speakers are more than competitive in their pricing - we like to share our toys and if we can find a way to give you the best sound for less, then we will do it. 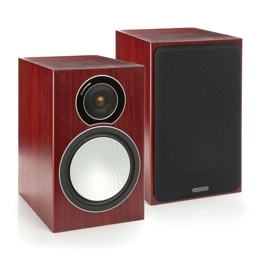 We challenge you to find a better sounding, better made speaker at the same price. So email us, call or just visit and we'll see if the Monitor Audios are right for you. There you have it - a whole new range of speakers from one of the most prolific and fastest moving designers in the audio world. From a pair of over-achieving bookshelf speakers to a complete killer-cinema system topping out at around $8K. Here's the line up - all models come in a choice of a rich red walnut (the best seller), light oak, black ash or a thoroughly modern gloss white on selected versions. Check out our other Monitor Audio speaker options using the links on the upper right hand side of this page or visit Monitor Audio's own site here.